GeoWize will be supporting the Nebraska Economic Gardening pilot program: Nebraska EG Announcement. Are you ready to gain competitive insight? 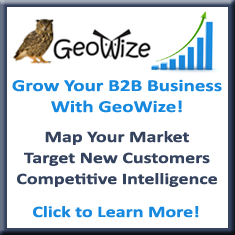 When I first heard of GeoWize I thought, “Why would I need a Google Map for marketing?” Wow! Was I blown away with the research, data, and most importantly, insight. This insight has caused us to revamp our entire marketing strategy. And we’re already seeing results. I don’t know where we’d be without it. Reflective Group completely overhauled their marketing strategy based on the insight gained from GeoWize. Reflective Group expects to hire 9 new employees and triple revenue to $1,400,000 in 2014. As an ESRI Business Partner, GeoWize provides demographic and business reports, maps and data for informed business decisions.